Kenji Miki (Japanese: 三木 研次) is a game designer that worked for Nintendo. 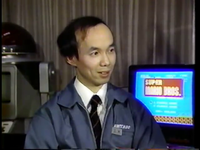 Miki designed several early games for Nintendo Research & Development 2 and Nintendo Entertainment Analysis and Development such as Ice Climber, and starting with the release of the Nintendo 64, oversaw the production of western and third-party games. Following the establishment of the Software Planning & Development division (which handled Miki's the supervision of western and third-party productions), Kenji Miki became the president of Mario Club Co., Ltd. up to at least November 2011, after which he was replaced by Kaoru Takemura.